That rocket spire is hard to miss and has even been described as Thunderbird 1! 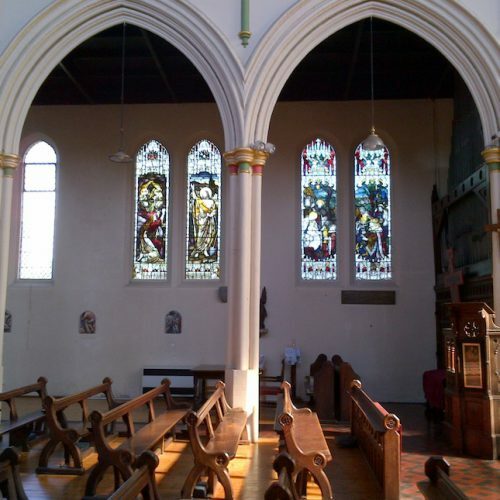 This is a truly welcoming church and open daily for those who want time and space to pray and think. 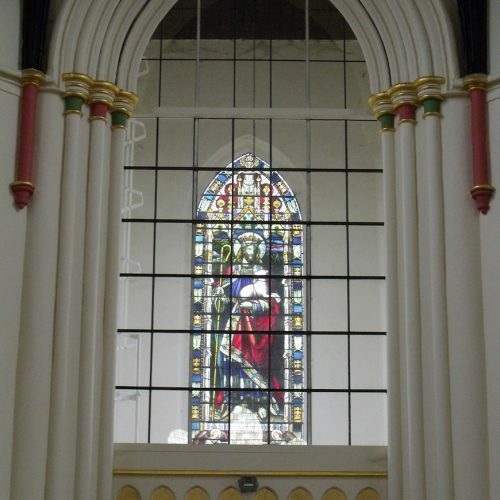 St John’s was dedicated in1841, built of white bricks produced at nearby Woolpit, and was the first major building to go up as Bury St Edmunds spread northwards. It met the needs of a town that was expanding with the building of the gasworks in 1834 and the construction of the railway which linked the town to Ipswich in 1846 and Cambridge in 1854. 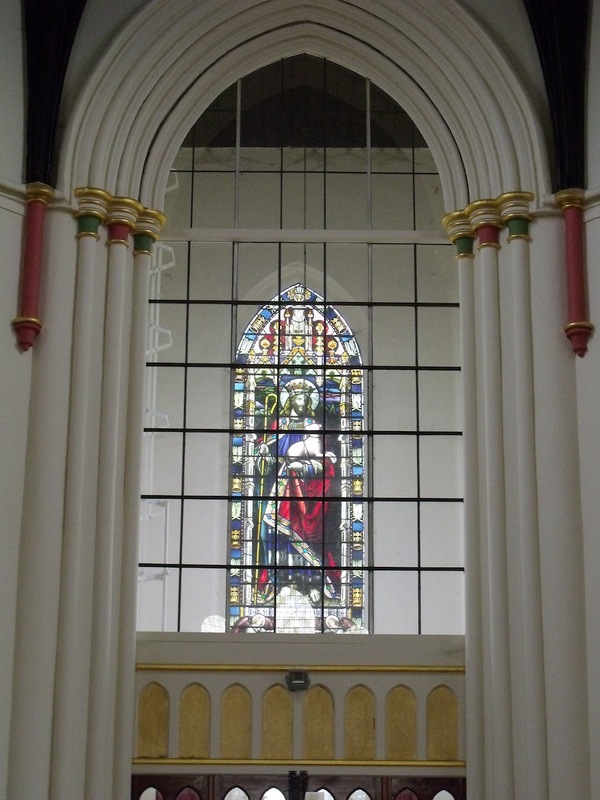 Endowed by the Marquis of Bristol, the church was built by William Ranger of Brighton who invented an artificial stone known as ‘Ranger’s Artificial Stone’. The magnificent tower was struck by lightning in 1871 and rebuilt a year later. At the corners of each stage are turrets with conical spires. 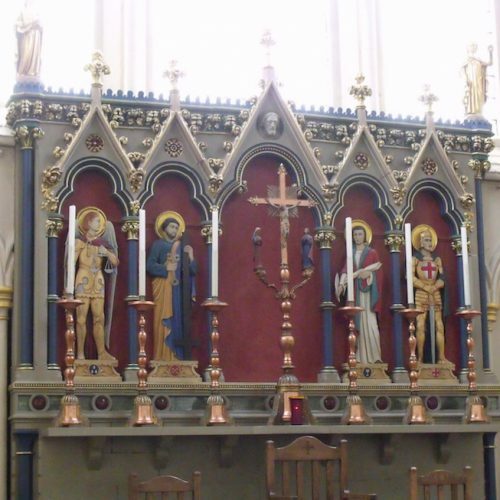 Visit the Suffolk Churches website to read Simon Knott’s fascinating account of how the church was transformed in the 1870s from a ‘preaching house’ to Suffolk’s principal Anglo-Catholic shrine. 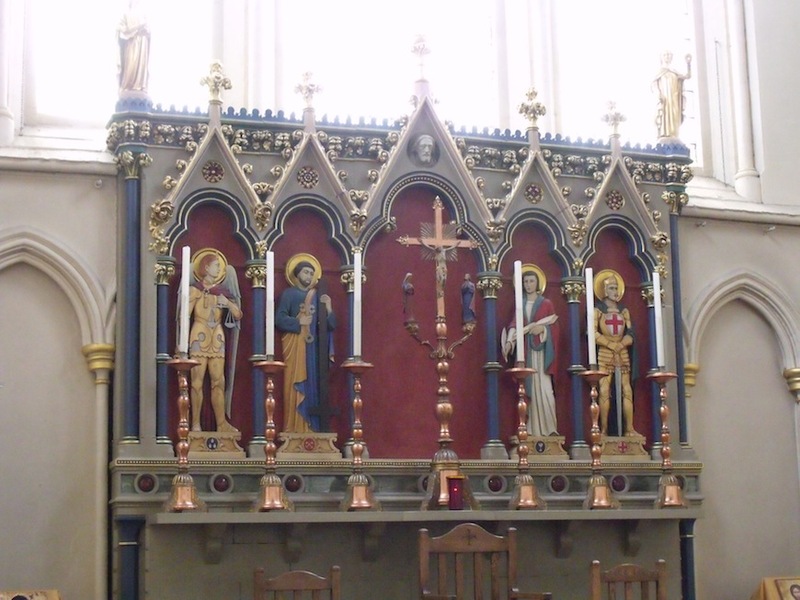 The church is beautifully maintained and presented – a calming space in a busy world where visitors can have time to think, or to wander and reflect on the devotional images, including a dramatic set of Stations of the Cross by the distinguished British artist Iain McKillop. Feeling spiritually refreshed, you can treat yourself to coffee and home-made cake in the fantastic Just Traid community café in The Centre next door. It’s open 10am- 4pm, Tuesday to Saturday. 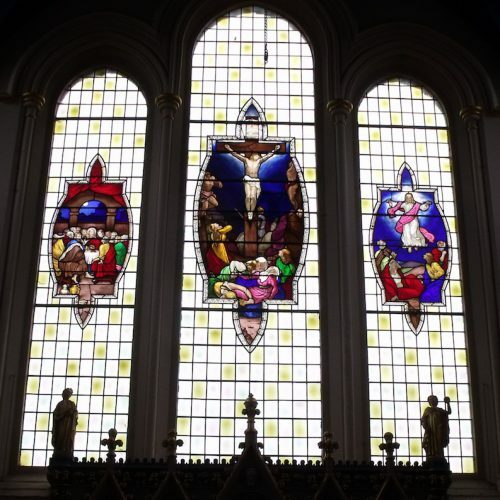 The church is part of the North Bury Team Ministry and an active supporter of several charities including Children in Distress and Town Pastors. 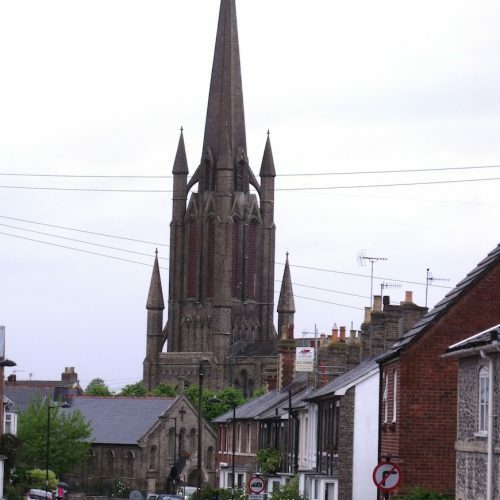 St John’s is easy to get to without a car as the main bus station and the train station, with its easy connections to Ipswich and Cambridge, are less than 10 minutes’ walk away. 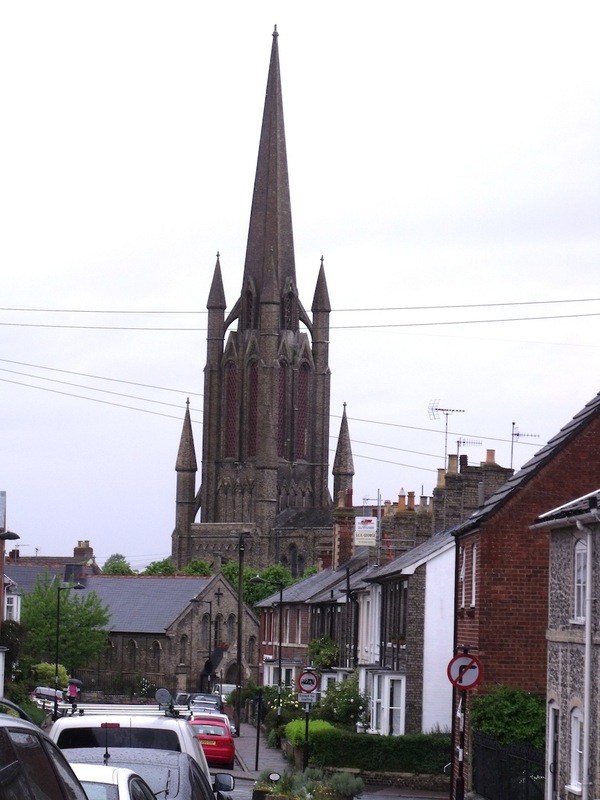 Less than 15 minutes’ walk are St Edmundsbury Cathedral and the Abbey Gardens. 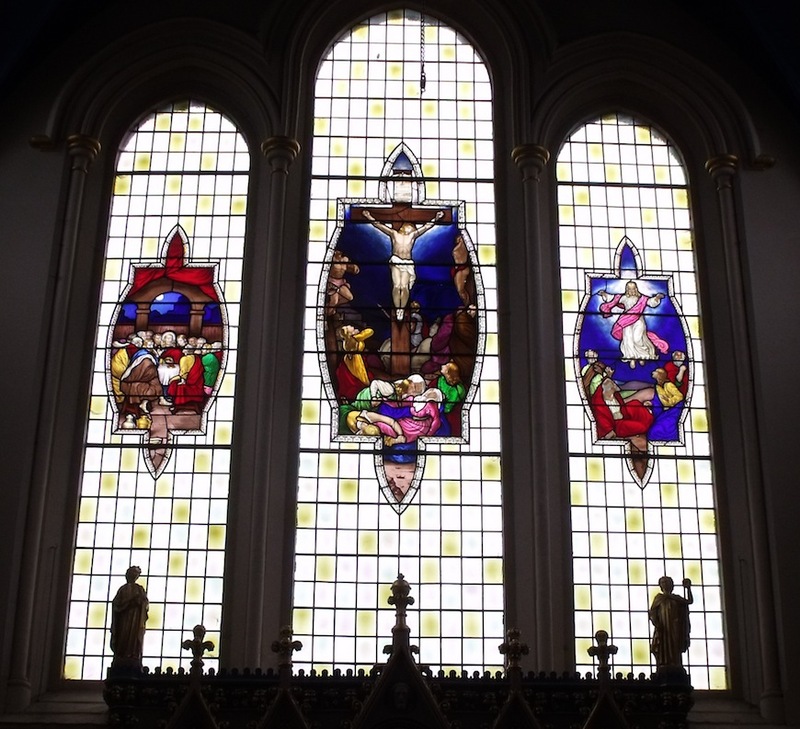 The neighbouring church of St Mary’s is also open and contains the tomb of Mary Tudor, Queen of France, Duchess of Suffolk and youngest sister of Henry VIII. View details of the nearest public car park here. Fully-accessible toilets, including baby-changing facilities, are available in The Centre during opening times Tuesday-Saturday 10am-4pm. 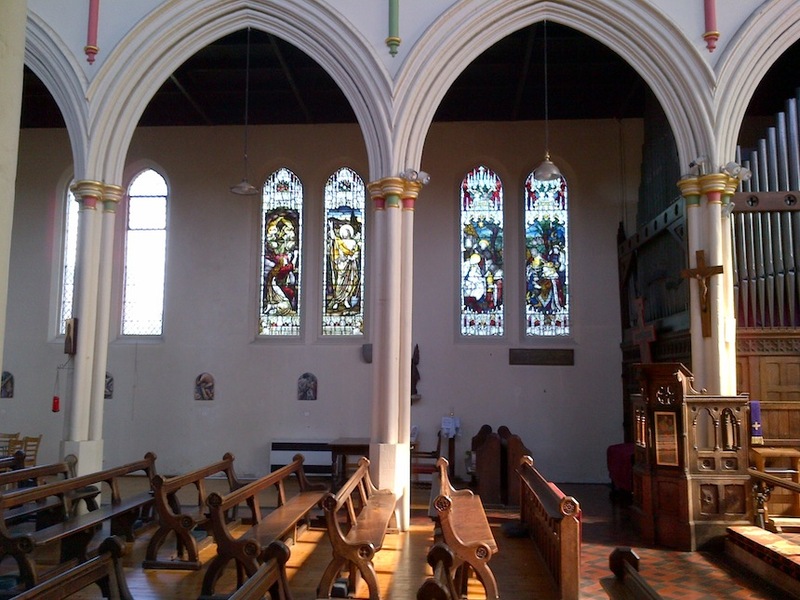 They are frequently available at other times if The Centre is in use, and are always available on request at times of church services.